About a week ago, it was time to make our gingerbread men. I make these every year, but I vary the size of the men, and sometimes make gingerbread ladies, as well. Many years ago, my daughters received little baking sets, that came with tiny baking sheets, small rolling pins and tiny gingerbread men and women cutters. I saved the cutters, when they outgrew that set, and use them for cookies. I also inherited my mother's large gingerbread man cookie cutter, which I use with great sentimentality. And then there's the mid-sized gingerbread man, that I bought in an after-Christmas sale when my children were all young. I think it makes the "right" sized gingerbread man, so I do favor this one. 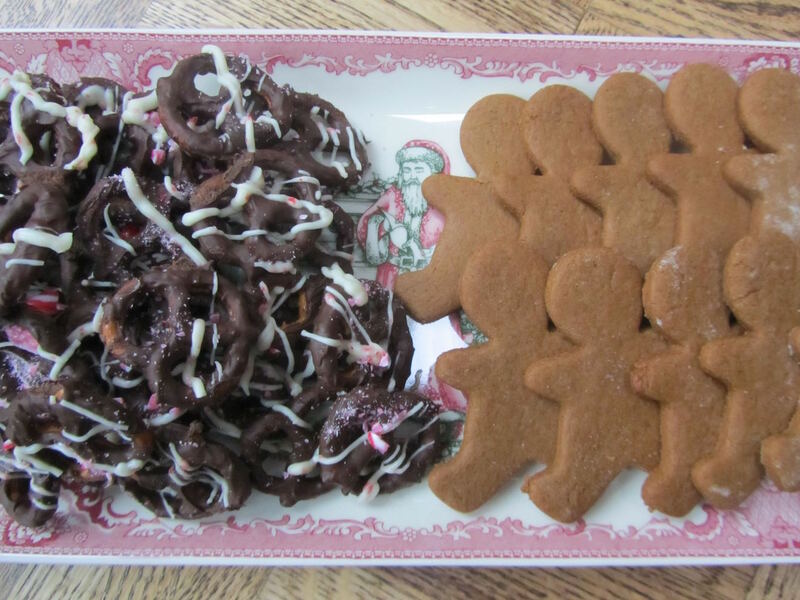 And that's what I chose for this year, mid-sized gingerbread men. I filled a tin with gingerbread men, and had some left over to give to my son's GF. I like the recipe from The Joy of Cooking, for gingerbread cookies, as it doesn't call for any eggs or baking powder, and very little sugar. The dough handles well, too. I can make the dough up one afternoon, refrigerate it overnight, and roll, cut and bake the cookies the next day. Also about that time, I had some heavy whipping cream near expiry. As I mentioned before, I whipped a couple of cups and froze in mounds, to use later. 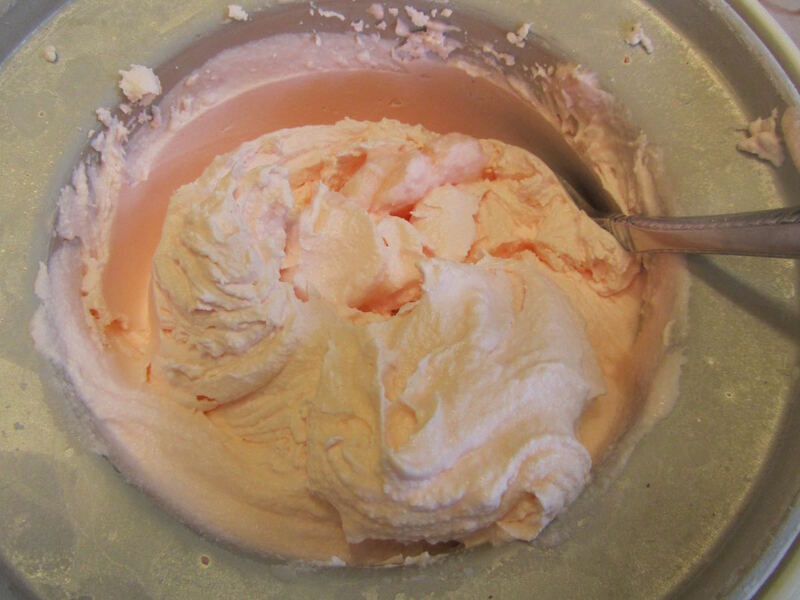 But I also used 2 1/2 cups of the whipping cream to make peppermint ice cream, to serve on Christmas Day with our Buche de Noel. I really enjoyed the washing up afterwards on that one (lots of spoons, spatulas, beaters and the ice cream paddle to lick). In addition to the heavy whipping cream, I used whole milk, a bit of sugar, pinch of salt and crushed candy canes. That's it. I didn't cook a custard, but microwaved the milk, to heat enough for the sugar and some of the crushed candy canes to dissolve, before adding the heavy cream and salt. 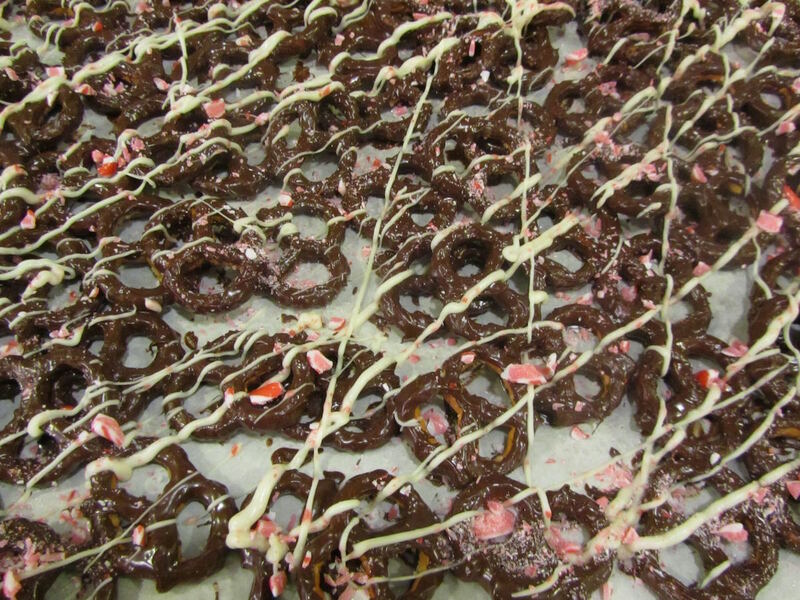 For our tree decorating party, I made a batch of chocolate and peppermint covered pretzels. These are pretty easy to do, and everyone in our family enjoys them. In a large bowl, I melted 1 cup of semi-sweet chocolate chips with 1 teaspoon of Crisco in the microwave, then tossed about 8 ounces of pretzels in the melted chocolate. I just kept adding pretzels, and tossing and tossing, until it looked like I had used all of the chocolate. I dumped the whole shebang onto a waxed paper-lined baking sheet, and separated them with a fork. I had about 1/2 cup of Wilton peppermint melting disks in the cupboard from 2 years ago, not quite enough to make a batch of peppermint bark candy. 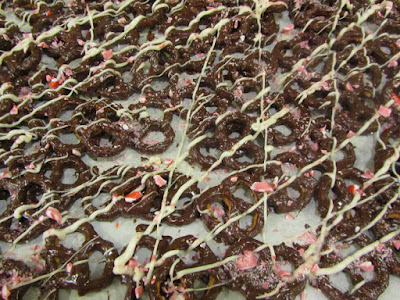 So I thought topping the chocolate-covered pretzels with a drizzle of that stuff would be festive. I melted those with Crisco, until thin enough to drizzle over the chocolate-covered pretzels. I put the peppermint-white chocolate in a used (but clean) zip loc baggie, then snipped the corner to make the drizzling go quickly and neatly. And finally, before the chocolate and peppermint melting disks had hardened, I sprinkled the whole mass with crushed candy canes. I still have the Buche to bake and fill. Cake rolls can be filled, rolled up and frozen until just before serving or icing. I'd like to get this done in the next few days. We'll see how that goes. I'm working on a mostly make-ahead Christmas dinner this year. I'd like to have the bulk of Christmas Day "off". How about you? What are your favorite Christmas goodies to make? Are there any family favorites that you just can't not make? Well done on you Christmas goodies! I'm really interested in that egg-free gingerbread cookie recipe, but googling "Joy of Cooking" Gingerbread Cookie Recipes is only bringing up versions with eggs. Can't you point me in the right direction...? Thanks you! They must've changed their recipe over the years. 1. Heat the oven to 350 degrees, and set out 2 cookie sheets. Stir well. The dough should be firm and not sticky. 5. Wet your hands and shape the dough into 32 little balls. Roll each ball in the sugar, and set it on the unoiled cookie sheets about 2 inches apart. Thank you, Patience! those sound delicious (and frugal!) We should really put together a frugal Christmas cookie cookbook. Have a very merry Christmas, Patience! I have to bake several dozen cookies for different church functions so I made snickerdoodles, monster cookies, christmas cutouts. Since I was making cookies anyway, I made enough for the family. I freeze the baked cookies and then a bowl of frosting in the fridge so when someone wants a cookie, they frost their own and even sprinkle sugar sprinkles if they want. I may end up doing another small batch of cutouts so there will be enough during the Christmas break for all those college kids! It sounds like you were very busy in the kitchen with all of those cookies to bake! what are "monster cookies"? Good idea to just keep the bowl of frosting in the fridge,and let family frost their own as they like, especially with how busy you are! Have a blessed Christmas, Alice! Mmm....now I want cookies! Trying to figure out how to get the most bang for my buck using the more expensive gluten-free flour this season. I want a few goodies that I can eat, but those to give away will of course be made with regular old flour to save money. Also interested in that egg-free gingerbread cookie recipe as I'm needing to make some treats for a church gathering after Sunday service this week. I think that's smart to bake some items which will be primarily for you, with GF flour so expensive. Then the items which are for others, who don't ave gluten problems, just use regular flour. I do that with dairy. If it's for someone else, primarily, then I just use regular milk. 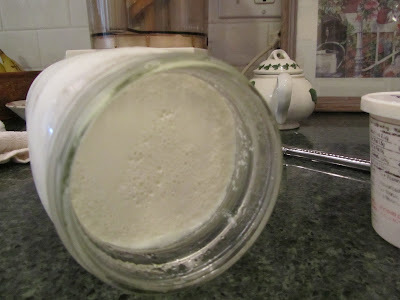 Alternative milk can be pricey, to use a lot of it, when it isn't needed. Have a lovely Christmas, Cat! It all looks delicious, Lili. We have just begun our Christmas baking with our daughter now home for her winter break. We made grasshopper cookies on Sunday--chocolate cookies with mint icing and a chocolate drizzle. We plan to make teacakes, spritz, peppermint/white fudge, chocolate fudge, and the one thing that I always am expected to make each year is almond roca. My family and extended family would not let me get away without making that. There is nothing not to like about the butter, sugar, chocolate and almond combination! I made almond roca with a couple of friends 2 years ago. It was fairly easy, and so yummy. I put it on my list to make again, this year, as I have everything I need - butter, almonds, sugar, and chocolate. Can hardly wait! All of your other cookies/treats sound so yummy, too! 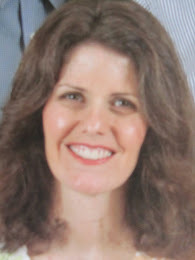 How wonderful that your daughter is now home for break. Enjoy your time together. Thank you, Lili. Enjoy the time with your family too! I've seen pictures of Buche de Noel cakes but have never known anyone who has made one. Please post a pic of the completed version! I've done some Christmas baking. Last week the kids and I did sugar cut-out cookies--I think I've shared before that they aren't my favorite (either taste-wise or with the amount of work and clean-up that goes into them) but the kids love it. I have a recipe that I make every year that is a chocolate shortbread bar cookie with a layer of fudge on it and nuts/chocolate chips on top. Fulfills those chocolate cravings. :) I tried a new recipe this year--a riff on magic cookie bars, but with white chocolate and Craisins. We liked it. 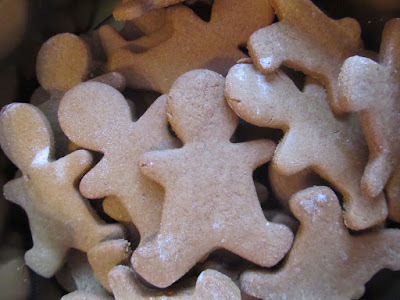 When the kids are home next week, we will make our traditional gingerbread men/women/teddy bear/angel cookies that my mom always made--it's the best tasting recipe I've ever tried. Maybe some date balls, too. I like Russian tea cakes but I don't always make them ... but I will make cinnamon rolls for Christmas breakfast. I often host a small family Christmas eve party and have experimented with a few different light dinners (we attend church with my brother/SIL and I like to have something ready that I can just whip out on the table when we get back home). For several years I did a soup/salad/bread dinner but not everyone wants a meal, so last year I did a cheese/smoked sausage and cracker gathering, but I made homemade bread so for those of us hungry for a more filling meal, we could make sandwiches out of it. That worked out better, so I'll be doing that again this year. Add a veggie platter and some sweets and we will be good to go. Wow, I guess I'm chatty about food and cooking! It's fun to read about everyone's traditions. I'm now thinking maybe a batch of tea cakes/wedding cookies is in order! I think I have everything to make them. I'll have to check the TG for that recipe. Thank you for mentioning it! I love Chex Mix!! Enjoy all of those yummies!! Have a blessed Christmas, KCMama! Have a very merry Christmas with your family, live and learn!